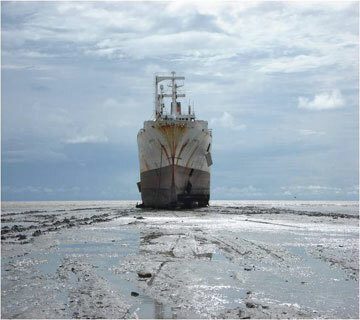 In 2006, a feasibility study was conducted by the Secretariat of the Basel Convention to determine effective measures to promote the implementation of the organisation’s Technical Guidelines for the Environmentally Sound Management of the Full and Partial Dismantling of Ships. 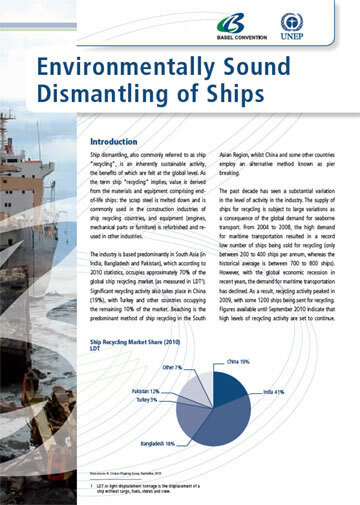 In conjunction with this study, the Technical Guidelines were translated into the languages of the main ship recycling countries: Hindi, Urdu and Bengali. The Government of Turkey also arranged for a translation of the Guidelines to be made available in Turkish. 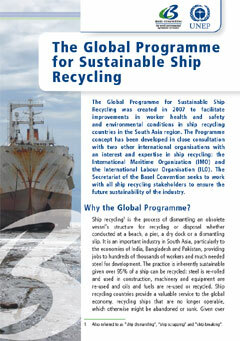 To promote an integrated approach to the ship recycling industry, by addressing infrastructural and other needs in the participant countries in and beyond the ship recycling yards.